A Vehicle repossession is a financial setback for the owner, but a substantial saving for someone who is looking to buy a repossessed car. If the owner of the vehicle is unable to make payments or defaults on the loan, the bank or leasing company has the right to repossess the vehicle without any warning. The number of repossessed vehicles have increased in the last few years because of lenient lending regulations, offering buyers a possibility of saving thousands of dollars on a used vehicle. If you are looking for a used repossessed cars for sale, read on to find out the benefits of repo vehicles and how to go about buying one. A repo car can save you anywhere between 25 to 40 percent of the cost of a similar used car, as banks or lenders would only want to recover their money and not make profit from the sale. The bank or lender often provides a lenient finance option to the buyer. It is also easy to negotiate on the interest rate of the car and get a good deal. In most of the cases, a repossessed vehicle is in better condition than used cars or police-seized vehicles. As these are not involved in a criminal offence or accident, there’s a possibility that the factory warranty would not be void. Banks and credit unions often let buyers look at their repo file, which has the details of repossessed cars and trucks they want to sell. All that you need to do is bid on the car you want to buy from the repo list. This is a long process, as the bank might be waiting for offers from other buyers as well. Repo reseller service providers help lenders sell vehicles from their inventory. As most of these companies pay attention to the condition of vehicles, chances are that you will find a car in a good condition. Buying a car from used car dealership means saving yourself from the hassle of bidding. These dealerships purchase the car, clean it up and make minor repairs before reselling it. Some of the dealerships also offer 30-day warranty and in-house financing options to buyers. Exhaustive inventory and more options to choose from are two main benefits of buying a repossessed car from online auto auctions. All that you have to do is register with the online auction site and start bidding. 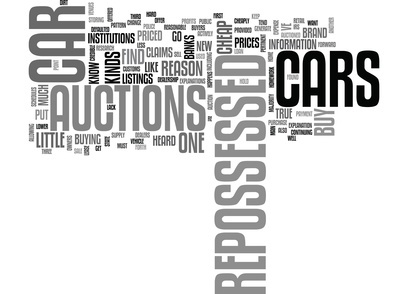 A repossessed car is also a used car, so you must check the history before buying it. Websites such as ClearVin have tools to provide detailed history report of the vehicle. Make sure that you don’t skip the research part. Repossessed cars are usually sold on “as-is, where-is” basis, so it is essential that you perform a thorough check of the car before buying it. Ask your trusted mechanic to inspect the car and also watch out for signs of accident or flooding. Also, test drive the car to check its overall performance. Repossessed cars can be a good deal, if you know your way around the car and have researched well before deciding the price. SalvageBid has close relationship with private auctions and provides its members around-the-clock access to repossessed vehicles on a single platform. Whether you are looking for repo vehicles, used or salvage cars, register with SalvageBid and start bidding. For details, feel free to reach us at +1 (360) 347-1300.